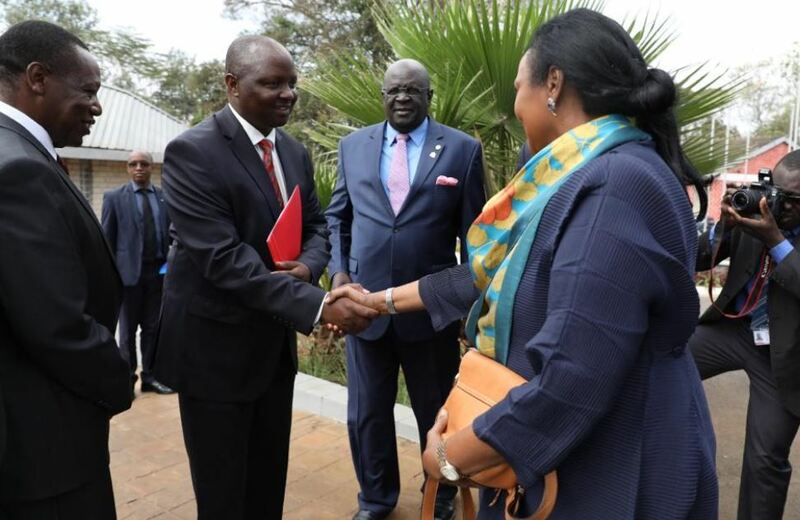 Below is a speech delivered by Cabinet Secretary for Education, Amina Mohamed today (8th October 2018) on KNEC, the ministry of education and education partners preparation for 2018 KCPE and KCSE exams. The Ministry of Education today held a meeting with critical stakeholders drawn from the Kenya National Examinations Council (KNEC), Kenya National Parents Association and Kenya Private Schools Association to discuss measures put in place to ensure credible national examinations. With just three weeks remaining before the commencement of the national examinations on October 28, 2018, I am proud to announce to the country that the Ministry of Education has finalized all plans to deliver the examination to 1,060,759 KCPE and 664,586 KCSE candidates this year. Over the next two weeks, the Ministry will work round the clock to ensure that all examination materials are delivered to the 459 containers across the country in readiness for the start of the examinations. We have also met various stakeholders to discuss roles and responsibilities essential to support this process. Last week, we met Regional Coordinators of Education, Kenya Secondary Schools Heads Association and Kenya Primary Schools Heads Association in all the regions to put in place a well-coordinated execution of this national exercise. All parents must desist from visiting boarding schools this term. Parents whose children will be found with mobile phones in school will be held personally responsible for the actions. Their children will immediately be suspended from school, and such candidates will not be allowed to sit the examinations. Only centre managers will be allowed to possess mobile phones during the duration of the examinations. The Kenya National Parents Association will work with Boards of Management during this final countrywide sensitization process to discourage school visits and use of mobile phones in schools. The Kenya National Parents Association and Boards of Management will liaise with security teams to reign in parents and schools that have collected money under the pretext that they will use the same to facilitate cheating in the examinations. Private school managers will ensure that all teachers who will participate in the examinations as science teachers to aid in practical subjects are fully registered with the Teachers Service Commission. The case applies to all those in public schools. Stakeholders at todays meeting have committed to abide by these resolutions to ensure they complement the work already undertaken by the Ministry and KNEC. Further, we wish to warn schools, parents and teachers collecting money to compromise the administration and management of examinations that that they will be brought to book. So far, we have placed 30 centres under intensive surveillance. Those found culpable will be apprehended, charged and de-registered. Anyone found attempting to cheat, collude or compromise the examination process will be arrested on the spot, charged and prosecuted. The Ministry also wishes to announce that we have completed the audit of all candidates who were recently displaced in Nairobi and Narok-Nakuru counties. We wish to announce that we have placed all the candidates in accessible neighbouring schools from where they will sit the examinations. I also urge parents who have since moved from the affected areas in Narok County to visit the education office in Narok County for assistance and information regarding their childrens new examination centres. Finally, I wish to call on all Kenyans, particularly political leaders and teachers unions, to sensitise their regions against examinations cheating and to fully support this national exercise. The future of our children and nation, depends on it. The Ministry will be fair and just in the administration of the examinations to ensure all candidates score grades that they deserve. What was the national mean standard score for 2018? Isn’t it something important to have national mean for each year of KCPE tabulated and availed in the knec portal?